Whether you like to entertain guests, have a big family, or enjoy getting all your friends over to your place for the holidays, your large kitchen is something special, and you should know that you’re lucky to own one. A large kitchen has a huge potential, and it is up to you to find the best large kitchen designs that are modern, practical, and beautiful. The endless choices may be overwhelming, so, our purpose in this article is to guide you through some outstanding large kitchen designs. Start your design project by taking a look at these wonderful tips and tricks for materials, lighting, color, kitchen islands, and more. A minimalist design is nothing without glass. You can incorporate glass into almost any contemporary large kitchen design through shelving, accessories, toppers for islands, and windows. Glass doors on cabinets are fun and modern. Stainless steel is probably the most popular metal used inside kitchens, and for a good reason: it never goes out of fashion. If you want an urban, modern feel to your large kitchen, use metal such as stainless steel, and even copper. Wood can be contemporary and sleek. It doesn’t have to give your kitchen that rustic and traditional feel. Choose lighter wood, such as ash or oak, for a minimalist feel. 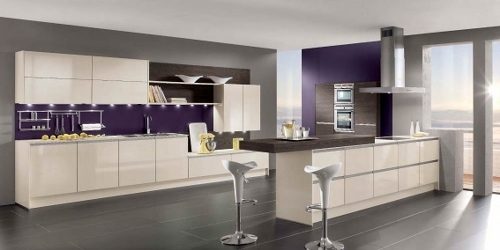 A great modern furniture design for large kitchens involves using sleek and unembellished kitchen cabinets. Remember that cabinets occupy almost 80% of the room, and getting them right means getting the entire kitchen right. If you want a clean and sharp looking kitchen counter top, then marble is the way to go. 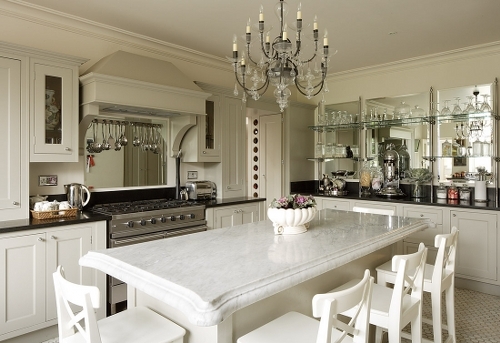 Modern large kitchen designs almost always includes marble or granite. However, most people are afraid of marble because they think it’s more delicate, and needs more upkeep. This is true. Marble is composed of calcium carbonate, which reacts to acidic substances. Acidic substances in the kitchen include lemon juice, orange juice, vinegar, tomato sauce, hot sauce, and some cleaning products. If you notice that something acidic has fallen on the marble, then you should proceed to clean it up, because if you don’t, then your marble will etch. Is it worth the trouble? For some, yes. Are you one of those people? Granite or marble? That is the question on every large kitchen owner’s mind. While marble is more delicate than granite, this doesn’t mean that granite isn’t also fabulous for counter tops. Black granite is something that will add a touch of style to any large kitchen. Lighting is key in the design of a large kitchen. Be inventive when incorporating light! The ceiling and underneath the cabinets are traditional ways of using light in the kitchen. But how about using some lighting fixtures from glass or metal to put the focus on certain spots of your large kitchen? You won’t find a minimalist kitchen designer that won’t use the word cool colors. Blues, silvers, grays, greens, and even whites or blacks will make any kitchen look modern. 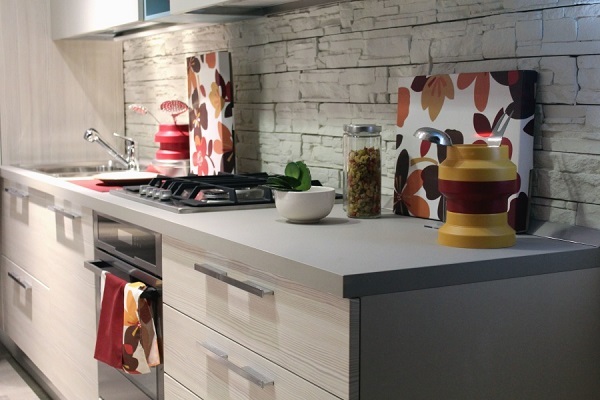 The three important things you need to keep in mind when combining these elements and creating your modern furniture design for large kitchen are: backsplash, accessories, and appliances. Tile or metal, when it comes to backsplash? 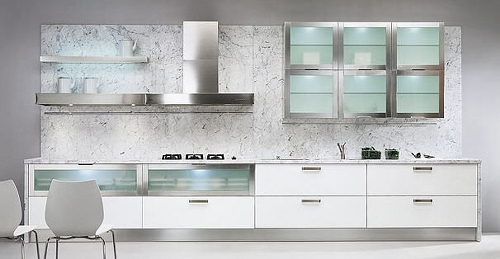 Will your appliances be made of stainless steel, or will you incorporate them all? Will you hang your pots and pans? How about your knives? If you are a proud collector of kitchen knives, you may want to display them all. 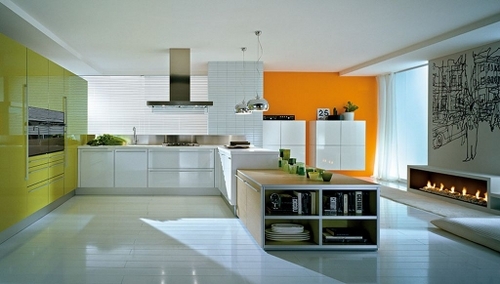 Create special colorful places in your large kitchen that are beautiful and also functional. You must admit that having a large kitchen has all the perks in the world. However, having to think of a modern furniture design for large kitchens also presents a challenge for architects, homeowners, and designers alike. The most important item in a large kitchen is the island. Designing one for generous spaces isn’t an easy task, because incorporating functional work areas is difficult. You wouldn’t want to walk for 2 minutes from the sink to the fridge, would you? Here are some things you would need to consider before deciding on a large island, and before designing it. 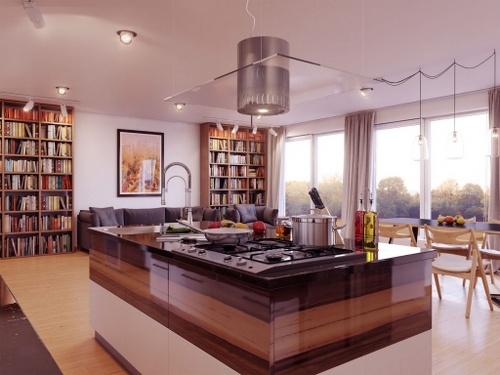 Firstly, think about your kitchen island as being the center of your kitchen. If it is too big, then it will look like the island IS the kitchen. Think about it like this: you want two people standing on opposite sides of the island to be able to give each other a glass of wine without straining too much. Secondly, the purpose of the island is to enhance the functionality of the kitchen space. An island is there to help you, and not become an obstacle. You need to add value to your space! How about using two smaller kitchen islands instead of a big one? Two smaller islands have their charm and functionality. You can avoid having to walk around the obstacle, and you can divide functions for each island: one for preparation area, and the other one for entertaining and serving guests (you can also equip it with a warming drawer). Kitchen accents are just as important as the main furniture items and appliances that you will adorn your kitchen with, especially in the case of large kitchen designs. Think about the fact that you have a lot of space for accessories, decorative items, and accents that will make you kitchen stand out. One example of a lovely and functional kitchen accent is a banquette that you can add to the kitchen island. That way, you provide some extra seating room, but you also make your kitchen look more interesting and unique. Don’t be afraid to also add all sorts of decorative pieces like wall art and plants. We hope our modern furniture design ideas for large kitchens have inspired you, and made you curious about kitchens and modern design. Remember that the kitchen is not a pristine space that needs to be protected. It is a war zone, where people cook, eat, drink, have fun, and live. Create a space that will accommodate that, and never feel sorry for any stains or marble etching! Have any other large kitchen designs to suggest? Share your experience in the comment form below!